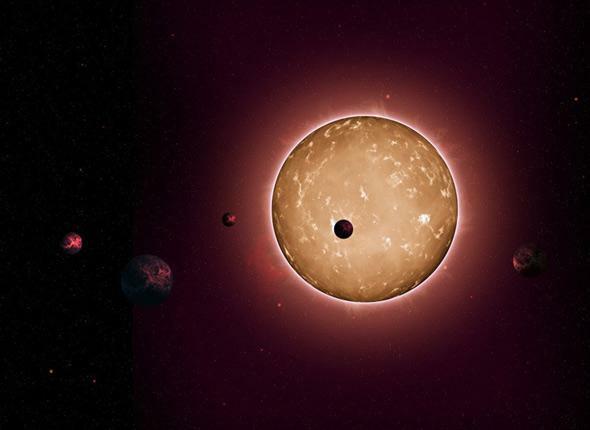 Exoplanets: Five extremely old planets found around Kepler-444. Artist drawing of the Kepler-444 system. Astronomers have announced what may be the most interesting exoplanet discovery yet made: five planets, all smaller than Earth, orbiting a very ancient star. And I do mean ancient: Its age is estimated to be more than 11 billion years old, far older than the Sun. These are old, old planets! The planets were found using the Kepler space telescope, which uses the transit method: If a star has planets, and we see those orbits edge-on, the planets pass in front of their star as seen from Earth. This blocks a bit of the light, and we can measure that. The amount of light blocked (compared with known properties of the star like its size) tells us how big the planet is. The length of time it takes the planet to transit the star also gives us its orbital period, orbital size, and an estimate of its temperature. The star is called Kepler-444. It’s a bit cooler, more orange, and smaller than the Sun (a K0 dwarf, if you want the details), and is about 117 light-years from Earth. That’s relatively close! Amazingly, it’s actually a triple-star system: There’s a pair of cool red M dwarfs orbiting each other, and the pair in turn orbits the K star. The binary is about 10 billion kilometers from the K star, about twice the distance Neptune is from the Sun. The five planets orbit the primary K star, and are called Kepler-444b up to Kepler-444f. All five are smaller than Earth, and get bigger in order with their distance from the star: Kepler-444b has a diameter of 0.403 Earth, Kepler-444c is 0.497 Earth, d is 0.530, e is 0.546, and f is the biggest at 0.741 our home planet’s size. The planets are not in any way Earthlike! The system is very compact; all five planets are quite close to their parent star—even the most distant one, planet f, is closer to its star than Mercury is to the Sun—and therefore pretty hot. They all orbit the star in fewer than 10 days. They’re pretty well cooked. Assuming the planets formed along with the star—a reasonable assumption—these planets have been around a long, long time. The Universe itself is 13.8 billion years old, and the Milky Way galaxy somewhat younger. These stars and planets formed when the Universe itself was young. Put it this way: When the Sun and Earth formed, these planets were already older than the Sun and Earth are now. Quite a bit, actually. For one, until now we weren’t sure just how old planets could be. We’ve found some Earth-sized planets older than us, but none this old. Initially, the Universe was almost all hydrogen and helium, with the heavier stuff coming later. The iron and nickel in the Earth, for example, were formed in supernovae, massive stars that exploded billions of years ago. As the Universe ages, it gets more and more of these elements as more of these big stars explode. When Kepler-444 formed, there were relatively fewer of these heavy elements, and spectra of the star confirm a paucity of elements like iron. We’ve discovered enough exoplanets now that we see an interesting relationship between heavy elements and planets: Gas giants (like Jupiter and Saturn) tend to form around stars that have more heavy elements; these elements aid in the formation of larger planets. But when you look at smaller, more Earth-sized planets, that relationship goes away. Smaller planets form around stars that have lots of heavy elements, and they also form around stars that have relatively few. The Kepler-444 system supports this. A gas giant planet would’ve been seen, so it looks like these five planets are all it has (or the biggest it has), and each is small and presumably rocky. Let me remind you, these planets are flippin’ hot. The coolest most likely has a surface temperature way above the boiling point of water. I wouldn’t think there could be life there. But don’t be so specific. Take a step back and realize that what this means is that Earth-sized planets could form around Sunlike stars even 11 billion years ago! That may have profound implications for life. You may have heard of the Fermi paradox: If life is easy to get started on planets, then where are the aliens? We do know that life formed on Earth not too long after the planet’s crust had cooled enough to support it. 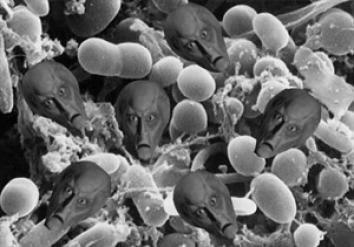 Let’s say it takes 4 billion years for those protozoa to evolve and build spaceships. It turns out that, even with the vast distances between stars and limiting your ships to far less than the speed of light, you can colonize the entire galaxy in just a few million years. That’s far less than the age of the galaxy. Perhaps you see the problem. If planets like Earth formed 11 billion years ago, and happened to form at the right distance for more clement conditions on the surface, life could have arisen long enough ago and started building spaceships long before the Earth even formed! They’d have planted their flags on every Earth-sized habitable planet in the Milky Way by now. We don’t know. There are too many “maybes.” Maybe Earth is special in some way that made life easier to form here. Maybe you need iron and nickel to build spaceships (but even then there are planets a billion or two years older than us that would’ve had plenty of such elements). Maybe evolution doesn’t always work its way to intelligence. Maybe every civilization advanced enough to manipulate its environment did so to its own detriment (cough cough). Maybe they blew themselves up. Maybe they’re out there but so advanced we don’t even recognize them. Maybe we’re just the first. That’s always been an idea in my back pocket to explain the Fermi paradox. Someone has to be the first. But that’s a bit tougher to swallow when you see rocky planets that are more than twice as old as our own home planet. Eleven billion years is a long time. Clearly, we just don’t have all the information yet. We’re just getting started here! We’ve discovered thousands of planets orbiting other stars, but there are probably billions of them out there. Billions! We have a lot more data to collect, a lot more information to analyze, and a lot more thinking to do before we can solve this particular mystery. But we’re working on it. Kepler-444 and its five, small, melted, ancient worlds are just one small piece of a puzzle that is vast and deep. And they’re a good start.